Everyone would have tried searching for some person they knew but are not in longer contact with, but searching for someone is quite a real tough task. But her Google comes to the rescue. Google People Search is the ultimate tool when it comes to searching for someone, it searches for profiles of people and not content of a site or blog. 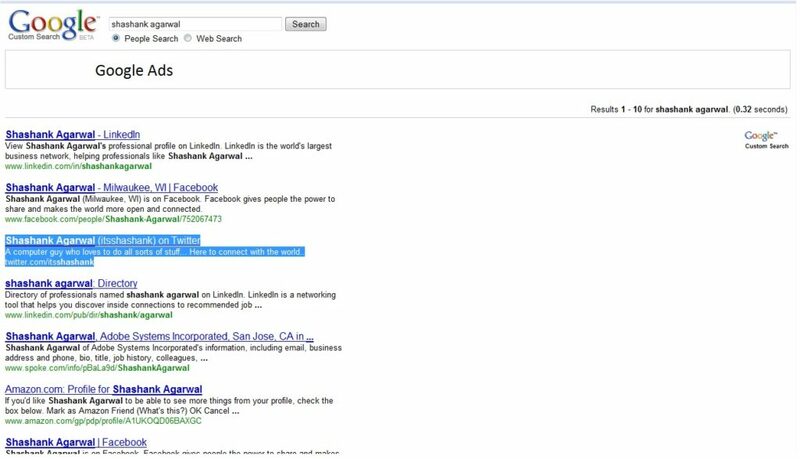 Google People Search looks exclusively in sites that lists profiles of its users. It searches sites such as facebook, twitter, Digg but also lists some other sites as well. When i searched for myself – Shashank Agarwal on Google People Search this is what i got this. The third one is the link to my twitter profile. While when i moved to second search page i found more links to my other social network profiles. Note- This is a custom made search, where users specify what they want to search for. You too can make you custom Search Engine on Google that searches according to you.